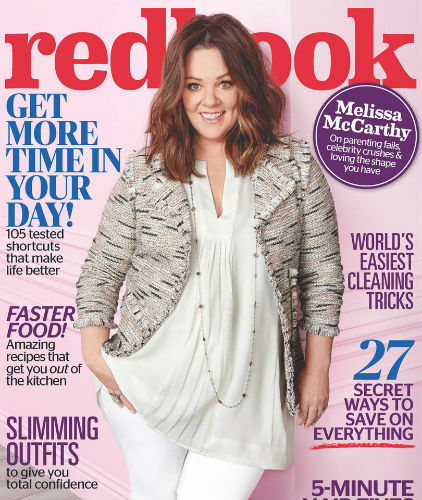 –Melissa McCarthy looks awesome on the cover of Redbook, where she talks about feminism, body image, and fashion. -The international Ghostbusters trailer has way more Chris Hemsworth. Seems like a misread of the room. -Meanwhile, director Paul Feig is defending Leslie Jones’s Ghostbusters character. –Mariah Carey saying “I still don’t know her” about Jennifer Lopez is giving me life. Bless you, Mimi! -I really didn’t think Bella Thorne would be the voice of reason in the feud between Kim Kardashian and Chloe Grace Moretz. Huh. –Mischa Barton is joining the new season of DWTS. What a time to be alive! -I could read about the weird connections between new odd couple Selma Blair and David Foster all day. -I’ve got nothing but love for the fact that Amy Schumer’s new book is called The Girl With the Lower Back Tattoo. –Padma Lakshmi admits she didn’t know the paternity of her daughter for a time. I don’t know why we all needed to know that, but speak your truth lady! -I spend the entire time watching The People vs OJ Simpson being fascinated by what John Travolta is doing — but unsure of whether it’s terrific or horrible. Either way, it’s pretty damn enjoyable to watch…as is Max Greenfield’s impression of him. -I still can’t really wrap my head around a movie where Sally Field and Max Greenfield play a couple, but I’m intrigued. -Fringe’s Anna Torv just joined David Fincher’s new Netflix series. I heart her and never understood why she hasn’t hit bigger, so this is good. -It’s International Women’s Day. Celebrate with Connie Britton’s secret weapon. -This TV blind item had my entire Twitter feed buzzing today. –Casey Affleck is not having a good week. Stay away from the back tattoos, Casey! -I have no interest in watching A&E’s Damien, but I love how they made up their writers room. -Is anyone even a little bit surprised that IMDB’s rating system is allegedly “completely and irrevocably rigged”? -The new Game Of Thrones trailer has arrived (featuring a boss cover of “Wicked Game” by James Vincent McMorrow).